Succeeds as a witty Elmore Leonard crime story...but also as a surprisingly affecting mid-life romance. 155 min. Miramax. Director: Quentin Tarantino. Cast: Pam Grier, Samuel L. Jackson, Robert Forster, Michael Keaton, Robert De Niro. Perhaps the most distinctive writer-director working today, Quentin Tarantino certainly has a knack for giving modern audiences what they want, and doing it in a manner more refined than anyone else's. Call him Spielberg with Tourette's: Tarantino may not be as intellectual as other filmmakers, but he has savvy to spare; he knows how to grab the gut and tickle the funny bone as well as Spielberg knows how to play the heartstrings. 1997's Jackie Brown shows Tarantino arguably working at the top of his game. With the ultra-arch, critically and commercially popular Pulp Fiction under his belt, Tarantino added some heartstrings to his orchestra. 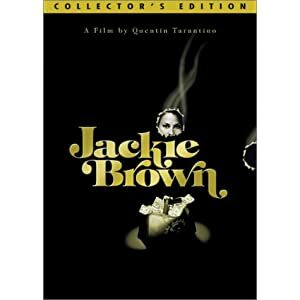 Jackie Brown succeeds as a witty Elmore Leonard crime story (adapted from his novel Rum Punch) but also as a surprisingly affecting mid-life romance. Jackie Brown has a distinctive vibe that's at odds with Tarantino's wired public persona. Yes, Jackson's funny-scary character lets fly with 38 instances of the "n"-word (as counted by writer-director Spike Lee), but Ordell is a slow-burn character as opposed to his blazing Jules in Pulp Fiction. In that film, people talk first, shoot later, and think last; in this one, at least some of the characters conspicuously mull things over. Jackie plays gangland chess, thinking three moves ahead, and we're frequently made aware of what Max is thinking but not saying, a unique phenomenon in Tarantino's hyper-verbal universe; Grier and Forster show themselves to be entirely resonant in depicting these lives of quiet desperation and hope. Tarantino completes his laid-back vibe (deceptively laid-back, of course, as this is a crime film of considerable urgency) with his soundtrack selections, including Bobby Womack's "Across 110th Street" (the theme to an earlier film of the same name) and songs by The Delfonics and The Meters. Despite the danger, it's an inviting world. 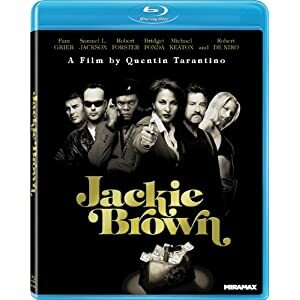 Lionsgate brings Jackie Brown to Blu-ray in a hi-def transfer comparable to the fine one for Pulp Fiction (both were approved by director Quentin Tarantino). Any artifacting here is negligible; much more noticable are the film-like results, general stability of the image, true color and contrast, and improved resolution. The photography for Jackie Brown results in some softness to the image in midrange and long shots, but closeups excel in detail. The lossless DTS-HD Master Audio 5.1 mix here likewise sounds in tune with its Pulp Fiction counterpart: terrific results in the music department, potent effects work, and ever-clear dialogue. The all-new "Breaking Down Jackie Brown" (43:49, HD) gathers the critics Elvis Mitchell, Scott Foundas, Stephanie Zacharek, Tim Lucas and Andy Klein to discuss the film. We also get the previously included bonus feature "Siskel and Ebert 'At the Movies'" (4:46, SD), which presents Roger Ebert and Gene Siskel's review of the film. "Jackie Brown: How it Went Down" (38:55, SD) features set footage, clips, and vintage interviews with Quentin Tarantino, Pam Grier, Robert Forster, Samuel L. Jackson, Robert De Niro (who sits next to Tarantino and says...nothing? ), Bridget Fonda, Michael Keaton, Elmore Leonard and others. "A Look Back at Jackie Brown" (54:42, SD) is an interview with Quentin Tarantino. "Deleted and Alternate Scenes" (15:29, SD) come with an introduction by Tarantino. Jackie Brown on MTV, including "Promotional Contest" (1:03, SD) and "MTV Live" (14:22, SD); a Marketing Gallery with three trailers (3:50, SD) and eight TV spots (3:56, SD); Still Galleries; Trivia Track; Soundtrack Chapters; "Robert Forster Trailers" (27:46, SD); "Pam Grier Trailers" (36:21, SD); and Pam Grier Radio Spots. All site content © 2000-2019 Peter Canavese. Page generated at 04/17/2019 03:48:32PM.